Can there be a healthy way to deep fry? Do you enjoy a rainy evening in your balcony with a cup of hot coffee and samosas/pakodas, but curb your cravings as soon as you think of your healthy diet chart??? If you didn`t know, deep frying can be healthy if you adopt the right methods. You heard me right! 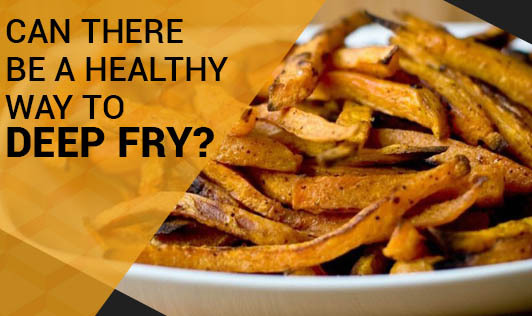 Scroll down to get a few tips to make deep frying healthy. Before I give you those healthy frying tips, let me explain to you the process of frying in a very simple way. Foods contain moisture and water as we all know. Moisture gets converted to steam when put in oil. As steam and oil do not mix, steam escapes out of food leaving food to get crisp due to browning. This crisp crust works as a barrier to prevent more oil from entering the food. Thus, oil absorbed by your food is minimal. This happens ONLY if you fry it at a specific temperature. Like baking, deep frying is also largely dependent on temperature. Frying below this temperature, absorbs lot more oil than required and frying above this temperature makes the food crisp from outside and leaves the food uncooked from inside! • Use oils that have high smoking point like olive oil, safflower oil, soyabean oil, canola oil. Refined oils have comparatively higher smoking point than the crude oils. • Do not overload your frying pan with too much of food as this decreases the temperature of the oil in the pan, leading to increased absorption of oil than required. Fry in batches. • Instead of only wrapping the fried food with paper, it is better to drain the excess oil with a slotted spoon and placing it on a paper napkin to absorb extra oil. This is not to promote deep frying but just to explain that no food can be unhealthy, if made in the right way. Again, deep fried foods from a restaurant or a cafeteria is definitely unhealthy as they are fried at temperatures above smoking point and the oil is reused many times. Remember, "Moderation" is the key to stay healthy and fit. You can follow the above basic tips before deep frying and still not feel guilty. Happy cooking!